Natuzzi builds his own story starting from a series of values, considered as the strong roots of the brand. Thanks to these values the company managed to expand at an international level and branch out its work. A growth structured as the ramifications of a tree, a symbol that recalls and reiterates the importance of the environment in which we live. The great interest regarding the environmental sustainability has in fact led the company to develop a renewable energy plan. The head office from Santeramo in Colle has 5 active photovoltaic plants, as well as Matera and Laterza factories producing electricity and reducing CO2 in the atmosphere thanks to 21.000 photovoltaic modules. This great participation regarding the environment is set forth by international certifications. The design of a sofa or an armchair, as well as a bed or any other piece of furniture, is managed in detail; the quality and durability of the raw materials is certified through numerous tests regarding load, robustness, wear and light resistance. The strength of a majestic tree is proven by its fruits and Natuzzi has been able to give many: the numerous Italian and international awards received certify the prestige of the brand. From the prestigious Hall of Fame American Furniture (2008) and China Awards Capital Elite Prize (2010), to the most recent Italian Talent Award (2015), each symbolizes a fundamental stage in the extraordinary growth of the company. Contact us for further information on furniture projects and prices. The story of the company began in 1959, when Pasquale Natuzzi decided to open the first workshop in Puglia; the first sofas were 100% handmade. In the ’70s the workshop meets the flow of new ideas: new collaborators, many of whom artisans, created innovative collections. Natuzzi marks its style in the ‘80s with the colored leather sofas collection. The market expands beyond Puglia, across the ocean, in the United States. The US success leads the company to be listed on Wall Street and to expand its collection with additional furnishing accessories. These are the years of technological progress and the introduction of recliner mechanism. Natuzzi’s worldwide fame takes roots later with the opening of new stores all over the world: Dubai, New Delhi and Sidney are just a few. The growing partnerships with internationally renowned designers make the brand one of the most famous in the world of furniture. Although the production now includes every room in the house, the sofas remain par excellence the symbol of the brand. There are several models in the catalog, among which stand out Avana and Milano. 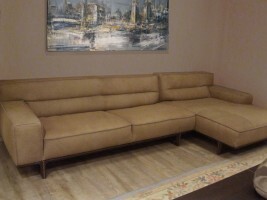 The first sofa is one of the bestsellers characterized by elegance and practicality. The exquisite quilted seat, together with the functionality of the adjustable headrests, allows you to gently glide on it, eliminating any ergonomics obstacle. The Milan model is distinguished by its vintage style, which is well suited to metropolitan style furniture, customizable through the wide range of fabric and select leather upholstery, as well as the different types of configurations (corner and linear sofas with and without chaise-longue). Natuzzi also allows small spaces to be as harmonious as they are functional: this combination finds substance in the sofa beds, comfortable and versatile, always with a special consideration for refinement. For the construction of frames, the chosen material is wood; it is tested before and after production in full compliance with international standards regarding the content of chemical substances. To make every product perform at its best, it is possible to perfect the maintenance through special products sold in the Natuzzi Sofa Cleaning Kit: each one is specific for different upholstery and guarantees exceptional results.